The Ekofisk II complex's production will be extended to 2050. The Ekofisk hub is one of the most important in the North Sea. All pipelines tied to existing Ekofisk platforms will be re-routed to 2 / 4 J. Statpipe gas will flow via a new line to the B-11 booster platform on the Emden gas line. The module support frame for 2 / 4 J's topsides being installed. The second of the two new Ekofisk II platforms 2 / 4 J was installed in July 1997. The picture shows the 6,400t process module. Abandonment and installation operations underway on the Ekofisk II project. This complex also formed a transportation hub for Valhall, Hod, Gyda, Ula, Statfjord, Heimdal, Tommeliten and Gullfaks. The infrastructure consisted of 27 permanent installations, ten of which were located in a central Ekofisk complex. Approximately 560,000bpd oil was piped 354km to the Phillips terminal in Teesside, while around 2 billion cubic feet per day of gas was piped 440km to the Emden terminal. In March 2009 ConocoPhillips was granted permission to use the Mærsk Innovator for drilling eight injection wells on the Ekofisk 2 / 4VA. The platform became operational in 2010. In January 2010 Seawell was awarded a contract to carry out maintenance services on Ekofisk 2 / 4K and 2 / 4X platforms. The five-year contract also covered maintenance services for the Eldfisk 2 / 7A and 2 / 7B. ConocoPhillips also operates Ekofisk South project located on the PL 018 in the Norwegian part of the North Sea. The Norwegian Parliament granted permission to develop and operate the project in June 2011. The project, aimed at improving oil recovery in the Ekofisk field, consists of 35 new production and eight water injection wells. Total commenced production from Ekofisk South in October 2013. "The infrastructure consisted of 27 permanent installations, ten of which were located in a central Ekofisk complex." In June 2009 the Big Orange XVIII vessel collided with the Ekofisk 2 / 4W water injection platform, damaging the bridge and well equipment. ConocoPhillips used the Maersk Gallant jack-up and the large crane vessel Thials to carry out repairs on the platform. The Ekofisk 2 / 4W was announced to be replaced by a new water injection platform in 2011. ConocoPhillips awarded a $120m project management, engineering, construction and delivery contract for the new platform in June 2008 to FMC Technologies. A sub-contract worth Nkr50m for construction of subsea equipment for the platform was awarded by FMC Technologies to Grenland Group. Technip was awarded the contract for installation and commissioning of subsea facilities connecting the new platform with the Ekofisk complex. ConocoPhillips was granted permission for the installation of a new accommodation facility, Ekofisk L, in March 2010. The new platform, which replaces Ekofisk 2/4 H and Ekofisk 2/4 Q, came into service in 2013. ConocoPhillips contracted Aibel in July 2010 to provide engineering, procurement, construction and installation services for the platform. The company will also connect the platform to the Ekofisk complex. Work was started in 2011 and completed by 2013. The contract for building the platform jacket and a bridge support jacket was awarded to Aker Solutions. Ekofisk 2 / 4 J became the central platform in the Ekofisk area. It consists of an 11,400t, eight-leg steel jacket held in place by 16 piles totalling 5,500t. The jacket supports a 23,500t topside sub-structure with module support frame, process module, separation (transport) module and utility module. "The project, aimed at improving oil recovery in the Ekofisk field, consists of 35 new production and eight water injection wells." Like the 2 / 4X, it stands in a water depth of 76.1m, although it is rated for 90.1m to obviate potential subsidence problems in the chalk reservoir. The platform has a processing capacity of 260,000bpd oil (total export capacity of 420,000bpd), 21.2 million cubic metres per day of gas and 31,800 million barrels per day of water. 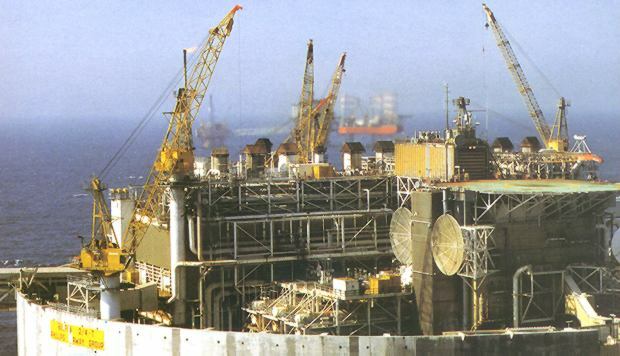 When 2 / 4 J became fully operational, a number of platforms started to be decommissioned. Production from third-party fields such as Valhall, Gyda and Ula were merged at 2 / 4 J and then piped to Emden and Teesside. Statpipe gas production flowed via a new line directly to booster platform B-11 on the Emden pipeline. By 2006 only two of the original Ekofisk Centre platforms were operational. Existing pipelines connected to either 2 / 4 R, P or G platforms were re-routed and connected to the 2 / 4 J platform, requiring over 63km of new lines to be laid. A total of 23 tie-in spools are already in place on the seabed. The jacket and the utility module for Ekofisk 2 / 4 J were built by Aker Verdal, while the module support frame and the process module was built by Amec Process and Energy. The separation module was built by Umoe Haugesund. The generators came from Dresser Rand in Norway and turbines were from by Nouvo Pigone. The jacket for Ekofisk 2 / 4X was built by Aker Verdal, the drilling module by Hitec / Dreco and topsides by Umoe Haugesund. The Edvard Grieg field (formerly Luno), is located in production licence PL 338, in the Utsira High area of the Norwegian North Sea.